The global infrared market in 2017 is $391.6M in 2017 and is estimated to grow at a CAGR 15.1% during the forecast period 2018-2023. The photo diode market holds the largest market share and generated highest revenue of 98.4M and is estimated to grow at CAGR of 10%. Increasing demand for home automation products, growth of process automation industry and the increasing usage in wireless communication are the key growth factors for IR sensors. What are the major applications for Infrared sensor? Infrared sensors have various end use applications which include night vision systems, temperature control, climate control, pedestrian detection, fall detection, pressure monitor, computers, gaming devices, cellphones, LIDAR, home appliances, blood glucose monitor, toys, optical power monitors, security devices, home appliances, gas & fire detection systems, spectrometers, thermal imaging etc. infrared sensors are also used in machine vision based products for monitoring assembly line and other automation purposes. New infrared sensors are revolutionizing AR glasses, phone cameras and driverless cars with this infrared sensors are enabling to see through smoke or fog, making autonomous vehicles cheaper and also creating night goggles for augmented reality. Si-ware systems a leading player in the industry has developed a small near infrared spectral sensor which is small in size and can be built into a smartphone. This sensor has many industrial and consumer applications. It can further be used in evaluating the health of soils, in food safety and analysis, oil and gas composition, as well as determine the purity of pharmaceutical drugs. Currently, it’s been tested in healthcare, agriculture and petrochemical industries and hence this would drive the market. Advanced digital infrared sensors in high speed cameras is used for vegetation-scanning from space to spot changes in human skin cells to help diagnose skin diseases. Also, it is used to map land cover and vegetation growth every two-days. Furthermore, these sensors can also be used for non-space applications. Recently, researchers and the Defense Advanced Research Projects Agency announced that they have developed an infrared sensor that runs on essentially zero power. This incredible feat of nanotechnology innovation has the potential for much grander impact than anything that has been seen before. 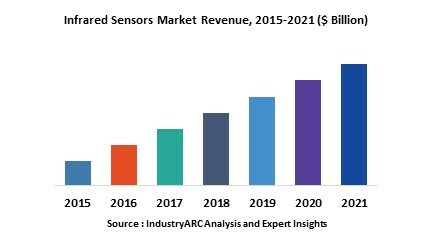 Who are the Major Players in Infrared sensor market? The companies referred in the market research report includes Exelitas, Murata manufacturing, Nicera, FLIR, ULIS, Melexis, Raytheon, Texas instruments, Omron corporation, Sofradir. Figure 26 Product Segment Wise In Percentages, As Audited By Official Auditing Partner E&Y.